Raven Chronicles is a journal of art, literature and spoken word, published in Seattle, USA. With a very similar focus to Catalyst, it seemed a natural pair to collaborate under the Sister Cities programme between Christchurch and Seattle. A launch event was held last month in Seattle for volume 25 of Raven Chronicles 'Balancing Acts' - this follows the launch of Catalyst volume 13 'Instant Chemistry' in November last year, the first leg of the collaboration. 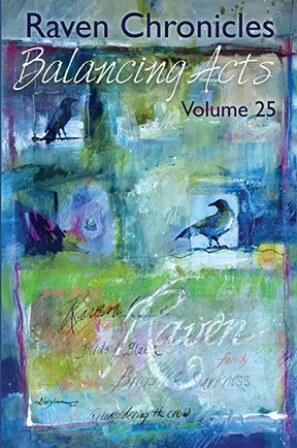 The next Catalyst Open Mic Night will feature a reading from the selection of Christchurch poets published in the Raven Chronicles Volume 25, 'Balancing Acts' feature. Come celebrate this unique cultural exchange that included a selection of Seattle poets and writers published in Catalyst Volume 13 'Instant Chemistry'. With readings from their selection of work: Frankie McMillan, Erik Kennedy, Heather McQuillan, Doc Drumheller, and Fiona Farrell. Raven Chronicles Journal Vol. 25: writers and artists examine the theme “Balancing Acts,” how we live our life, fully, and maintain our relationship with the earth/planet and the diversity of life on it. Biodiversity is balance in the dance of nature. Edited by: Anna Bálint, Phoebe Bosché, Matt Briggs, Paul Hunter, Doug Johnson. The U.S. contributors in this Balancing Acts-themed Journal live in seventeen states—Washington, Nebraska, Pennsylvania, California, Oregon, Illinois, New Jersey, , Virginia, Idaho, New York, New Mexico, Colorado, Texas, Alabama, Wisconsin, Florida, Washington, D.C.; and 52% are from Washington State. Contributors, particularly visual artists, also hail from ten countries—U.S., Germany, Colombia, Russia, Australia, New Zealand, Spain, Canada, Chile, Singapore. There are 58 illustrations/artworks in Vol. 25. We are pleased to present the work of a selection of established and emerging writers from New Zealand as part of the Sister Cities Program, a collaboration between Seattle and Christchurch, New Zealand. The editors of Raven Chronicles, A Journal of Art, Literature & The Spoken Word, are pleased to announce their nominations for the 2018 Pushcart Prize: Best of the Small Presses series, the prize chosen by Pushcart Press that anthologizes the best of the small presses publishing this year. The editors of Raven Chronicles nominate the following writers for their work published in Vol. 24 and Vol. 25, in 2017. 1. Fiona Farrell, “Decline and Fall on Savage Street”— Novel Excerpt, pgs. 57-68. Novel excerpt from Decline and Fall on Savage Street, Penguin Random House, New Zealand, 2017. 2. Edward Harkness “Neighborhood Crows”— poem, pgs. 22-23. 3. Nic Low, “Ear to the Ground”— essay, pgs 77-90. “Ear to the Ground,” first published in longer form in Griffith Review 35: Surviving, January, 2012 (https://griffithreview.com/articles/ear-to-the-ground/).